Enrollment: 2 – 6 years from 7:45 am to 5:45 pm. Parents can register their child at any time. Parents need to submit the child’s current health form with all immunizations up-to-date. 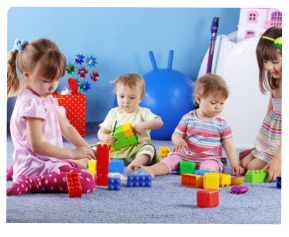 At our Daycare program, children are engaged in a play-based, child-centered, emergent curriculum that integrates literacy, math, social studies, science, the arts, motor development, and socio-emotional development and skills into all parts of the child’s day. 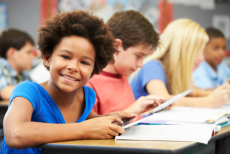 We emphasize the development of higher-level thinking and problem-solving skills, which are the foundation of every good learner’s academic ability. 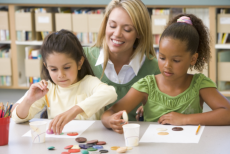 Our teaching strategies are based on goals in five major areas of development: social/emotional, physical, cognitive, language, fostering the child’s natural curiosity and creativity. Unless the weather forbids, children are taken to the park every day to explore nature, jump, skip, and run around playing ball. They enjoy the out-of-doors with their large motor activities. We eat nutritionally balanced, wholesome foods for both meals and snacks. Children are encouraged (but not forced) to eat a variety of foods. Meals and snacks are served family style. Children are encouraged to use this time to share their experiences with each other. Manners are taught, and practiced during this time as well. Please have your child here on time if you want them to have breakfast. If your child arrives after this time we will expect them to have eaten at home. Please notify us of any food allergies or restrictions your child may have.